My husband hates it when I eat two kinds of food: Indian food and anything with truffles. He claims the smell lingers for days on end, giving him a headache. As much as I love my husband, I’m also a dedicated food enthusiast…sorry, honey bunny. NARS Thakoon was inspired by the bright colors of Indian spice markets. The names of the polishes are also names of Indian spices. Amchoor reminds me of ataulfo mangoes, also known as champagne mangoes. I’ve heard great things about Asian mangoes, particularly from India and the Philippines, but I’ve never tasted them. The closest I can get in the US are Mexican ataulfo mangoes, which are sweeter than standard grocery store mangoes. The best time to visit the Charleston, SC area is spring time, especially if azaleas are blooming. The nearby Town of Summerville is also known as Flowertown due to the prevalence of azaleas in their downtown area. Anardana resembles these flowers very closely. The blue-green quality in Koliary brings me back to my favorite place, Opal Beach. Opal Beach is part of the Gulf Islands National Seashore, located between Pensacola Beach and Navarre Beach. If you are ever in Northwest Florida and desire to really get away from it all, definitely consider Opal Beach. One of my knitting friends is a die-hard University of North Carolina at Chapel Hill sports fan. This would definitely suit her tastes. Lal Mirchi is my favorite due to the color’s richness. It reminds me of shiny hot red peppers, such as bird’s eye chilis. 2014’s color of the year was Radiant Orchid, similar to Ratin Jot. The formula on these polishes are split. Anardana, Lal Mirchi and Ratin Jot were the easiest to apply, only needing 2 coats each. Amchoor, Koliary and Kutki needed 3 coats for opacity. 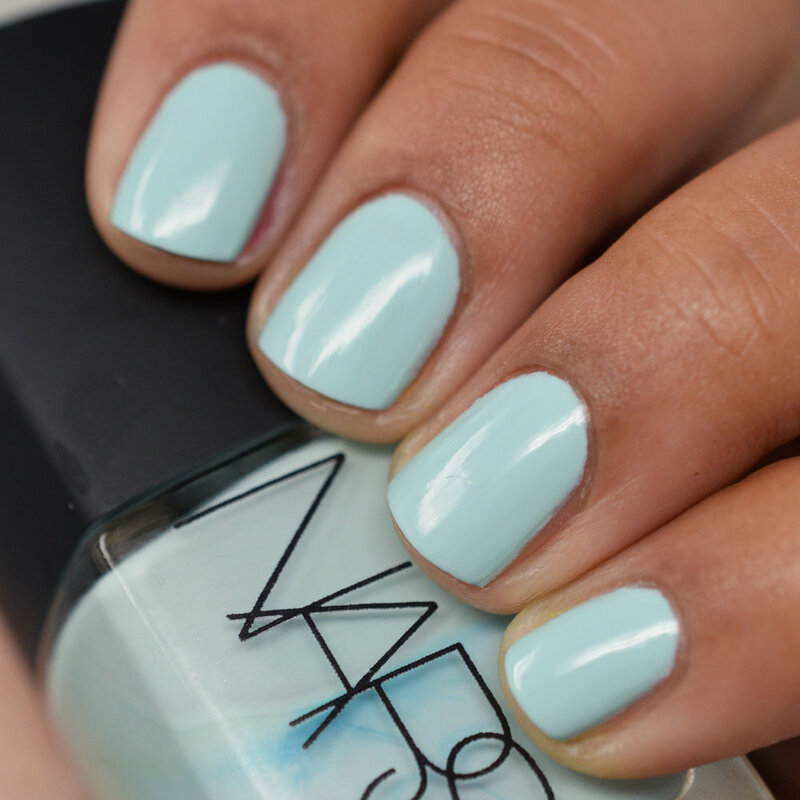 NARS Thakoon was a limited-edition release and is no longer for sale. However, you can find Amchoor, Anardana, Koliary and Ratin Jot on eBay below the retail price ($18).